I loved Moonshadow, the first novel in this trilogy. 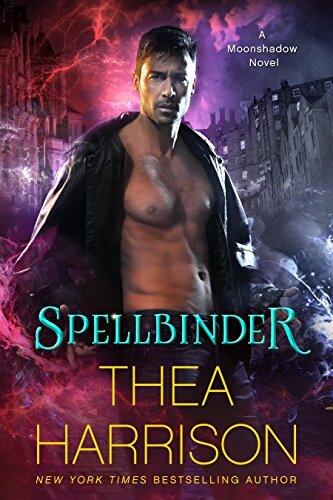 Thea is one of those authors who can make fantasy and magic feel real, who has me completely wrapped in the story. This time round we see the other side to Morgan, Queen Isabeau’s magician enforcer, leader of her Hounds. We met him mainly by reputation in the last book, knew him as a conscienceless killer, and now we see that its not him, he has to act as the Queen commands, has no free will. She took control of him centuries ago by magical means, and he is forced to obey her every command. He hates it, hates her, she killed his beloved Arthur, and he’s been waiting for her to slip, make a mistake all these long years, and then he’s going all out for freedom, even if it means his death. Then she does, she makes this tiny error in what she says and he takes advantage. He’s not free, not yet but her words allow him freedom for a short time to research the magical knife at the heart of her control over him. He has to stay away from any of the Light Court, they can tell him her wishes, and it acts like a command. While he’s researching and avoiding everyone he hears Sidonie play, is entranced and that leads to a string of events ending with her the Queen’s prisoner. If we didn’t know Robin, the Puck, and all he suffered from the last book, I’d think he was an awful person. He knows full well what will happen to Sid when the Queen gets her claws in, but he hates Morgan, hates that he was the instrument of his centuries of torture, as commanded by the Queen. He doesn’t know the full circumstances, thinks Morgan betrayed the Dark court he was part of, thinks he is the Queen’s lover and had a free hand in the atrocities he does. He sees Morgan is enjoying Sid’s music, and thinks to use her as a trap for him, use her to break up his relationship with the Queen. Its kind of a long logic thinking that because he’s following her tour, enraptured by her music that he will seek revenge on Isabeau for the atrocities she will inflict on Sid, but I guess Robin’s kind of flawed in his thinking anyhow. He doesn’t see Sid as a person, only a tool, and doesn’t care what happens to her. His plan will work – or it won’t. Either way he loses nothing by trying. I have to think of it the way he would, the way the Fae see humans, disregard them mostly as people, don’t really care what befalls them unless, as with Sophie from Moonshine, there’s some kind of personal connection. He’s devoted to Sophie, determined to protect her despite the fact she’s (mostly) human. He doesn’t know Sid so he’s not concerned about her. That changes though when he gets to know her. Poor Sidonie, she’s horrified, powerless, distraught at what’s happened and feels so alone. She does what anyone would do, demands she be released, give the queen the sharp side of her tongue and…suffers the results. As Robin planned Morgan soon gets to know of what’s happened but of course Robin doesn’t know of the restrictions surrounding Morgan, so his plans from there go wrong. Its another fabulous magical read, making me really feel for Morgan despite the awful things he’s done. In Moonshadow I hated him, here I see him as another of the Queens victim’s now I know the whole story, and likewise I felt so sad for Robin in Moonshadow, and had to keep reminding myself of what he’d been through when he was so casual about Sidonie’s welfare. Its like we’ve two sides to the story now, the Dark Fae and the Light Fae, centuries of history, of Isabeau’s horrific reign now look to come to a head, with the key players having a change of situation. I can’t wait for the final novel bringing everything together.